One of our youngest children really wanted my attention. He said, "Over there," pointing. I thought he was trying to show me something, but there was nothing of note in that vicinity, not even any kids, so I asked, "What are you showing me?" With that he began to walk, still pointing, stopping after a few steps, looking over his shoulder to let me know I was to follow. 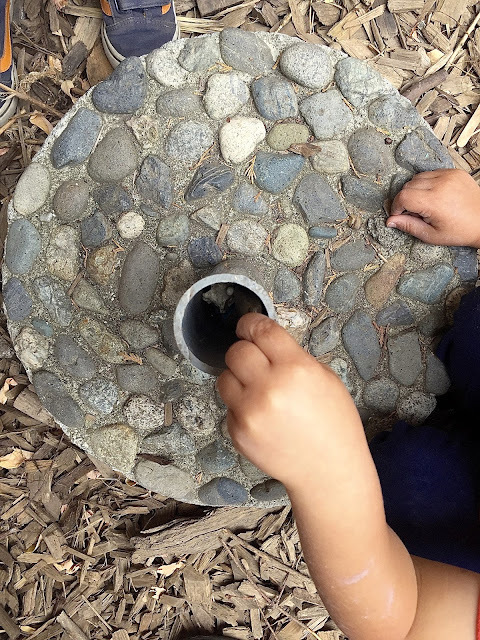 We made our way down to the bottom of the play yard where he pointed at the base a parent made us many, many years ago to hold the umbrella we put over the workbench on especially rainy days. I said, "That's for holding the big umbrella," but when he pointed inside the stand I realized what he was getting at without even looking into the hole. Whenever we use the stand we adults have to first empty the tube of all the bits and baubles that children, as they play, have dropped in there. In this case there were several florist marble "jewels" that he wanted. I said, "You want those out of there," to which he nodded vigorously, before attempting, and failing, to reach his hand in after them. Another child happened upon our scene, "What are you doing?" I said, "He's trying to get some jewels out of that tube." She dropped to her knees. 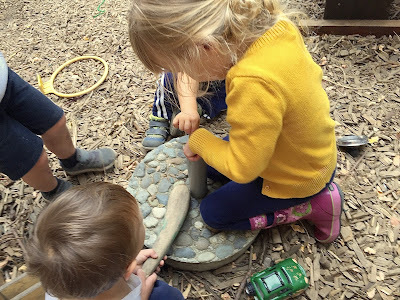 Being older and naturally inclined toward taking the lead, she peered into the hole, then after trying to squeeze her hand into the small space, said, "We need a stick." Another boy who had been drawn to the action, scavenged one up for her. It was a short, thin, brittle thing that immediately broke off in the hole. 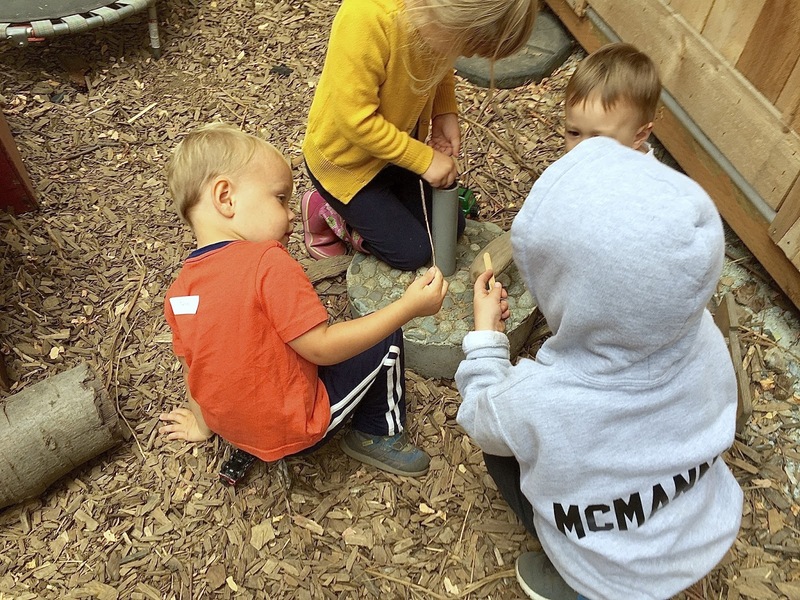 But no worries because by now there were four kids huddled about the umbrella base, all with sticks in hand, prodding at the hole. Yesterday, I wrote about a pair of girls huddled together over their mud puddle. In that case, I'd already been more or less quietly sitting against a tree when they began to play together nearby, so was in a position to eavesdrop without disturbing their play. 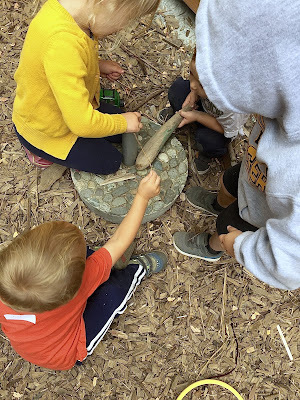 Most of the time, I spy the huddles from across the way, children with their heads together over something: an insect, a collection of rocks, a broken toy they are trying to repair, a story they are telling together. And most of the time, in my approach, I ruin it. For instance, one of them, upon noticing me, will call out, "Teacher Tom! Look what we're doing!" Or maybe my presence will attract extra kids to the huddle, wrecking the delicate balance of the original huddlers. There's usually a limit to how big a huddle can get -- I'd say five or six -- before it is not longer an intimate place in which to share, discuss, and grow a little knowledge from the soil of one another. In this case, however, I had been present from the start of the huddle around the umbrella base, not a distraction, but rather a part of it. As the children tried their various methods for removing those jewels, I stopped talking and moved away, still able to hear their words, but no longer an intimate part of the huddle. These are the moments I feel most like a researcher, as if I've hidden myself in some underbrush to study red tail deer in the wild. 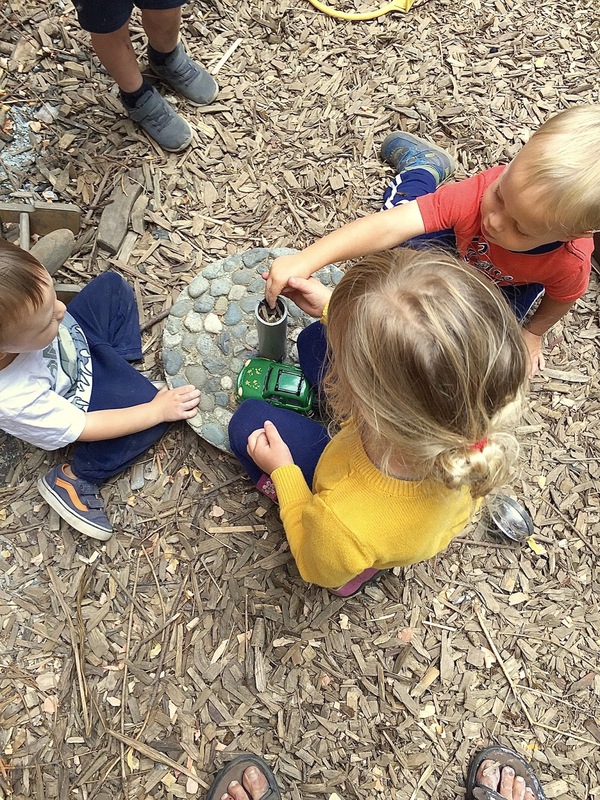 This is why most "research" into how children learn becomes so flawed: our adult presence turns it from a "wild" place into a domesticated one. 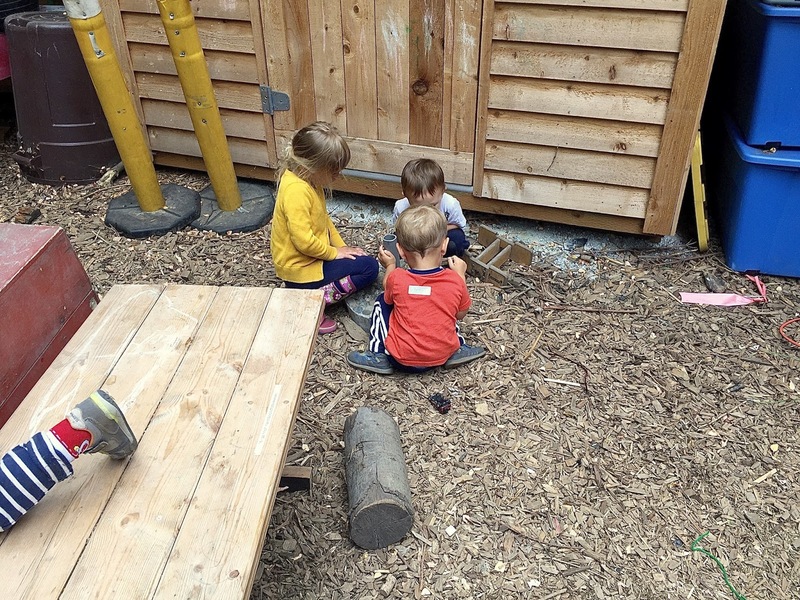 To be honest, as I sit like this, listening in on these huddles, I always think of the stories I've heard about how the great clinical psychologist, one of the pioneers in early childhood, Jean Piaget would observe children at play. I'm reminded of one of my university professors, an expert on what was called "leisure studies," who one told us that he had spent his entire career just watching people play. Most of the research we see on education today is done without this kind of silent, unobtrusive observation, but rather relies on the collection and interpretation of data in the style of businesses producing consumer products, like software or canned soup. 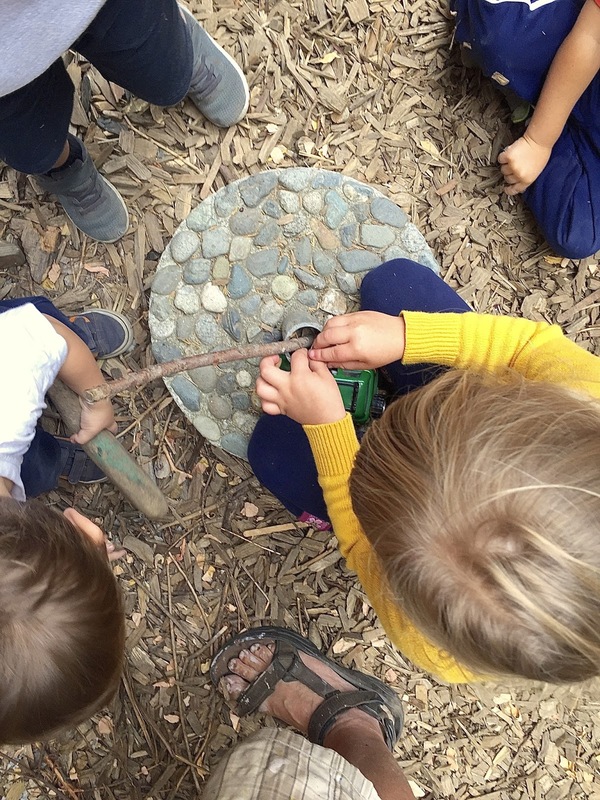 We may learn a lot about how individual children react to data collection (e.g., via standardized testing, formalized evaluation) and nothing at all about how they learn in the "wild." For that we need the sort of observation that teachers ought to be doing instead of forever instructing, directing, and managing children. The children in the huddle around the umbrella stand never did figure out how to get those jewels out. Instead, they wound up working together to "build a campfire" by stuffing the tube full of sticks and leaves, the boy who had wanted those jewels among them, happily toasting his pretend marshmallow, accepting that the wood chip offered him was a piece of chocolate and that another was a graham cracker. This is the natural habitat of children.